PSYCHOTIC Pre Workout by Insane Labz at SameDaySupplements.com® for lowest price. Psychotic by Insane Labz is the most potent stimulant pre training powder ever made. When you first try Psychotic you will think to yourself " why hasn't this pre workout been banned yet". With the addition of the trademarked ingredient Ampiberry which prolongs the stimulant life of ingredients for as much as 3 hours. Psychotic is made for the elite athlete and should not be used by beginners. One scoop of this product compares to 3-4 scoops of any of the mainstream pre training powders on the market today. Psychotic is made in a cGMP Certified facility and tested for purity and undergoes strict microbial testing to ensure your product is clean from pixie dust ingredients that are not on the label. Go PSYCHOTIC in the gym! Psychotic Pre Workout comes in 7 delicious and unique flavors. Cotton Candy, Fruit Punch, Grape, Gummy Candy, Watermelon, Apple, and Sour Cherry Colada. What are you getting from Insane Labz Psychotic ? Besides the extreme energy derived from the "PSYCHOTIC BLEND" which has a high amount of Caffeine, Psychotic also contains creatine monohydrate and beta alaine to aid your perfromance output at the gym. In addition to that, Psychotic features focus enhancers to give you that tunnel vision focus for your gym hit. Psychotice Pre Workout doesn't need crazy stimulants to be great. This potent forumla is not for the faint of heart; first test your tolerance then test your sanity and go PSYCHOTIC in the gym! How Much Caffeine is in Psychotic Gold? The label doesn't show how much caffeine is in psychotic gold so we reached out to Insane Labs. 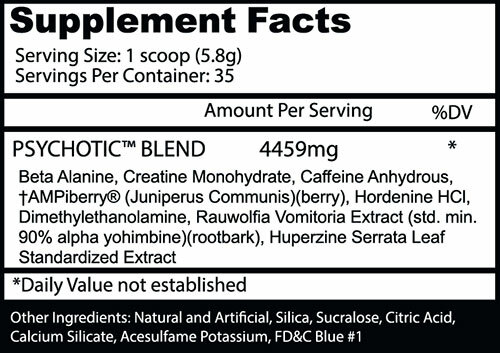 Insane Labs has confirmed there is approximately 300mg of caffeine in Psychotic Pre Workout. What's In Psychotic Pre Workout By Insane Labz? How Do I Take Insane Labz Psychotic Pre Workout? Dosage: Psychotic is not your normal pre-workout. Begin with ½ scoop to assess tolerance. Do ya wanna get stimulated for the gym, cutting thr grass, building a garage, a house whatever, if it involves physical activity...Psychotic is a good product. And for all you stupid people.... .its not to take and the go jogging or running. There is a difference. Ur heart will wanna jump out of your chest. Please stupid people...do not buy this product. It isnt meant for you. Seriously. We have a large selection of in-stock Insane Labz products including Pre Workout items and others for the lowest prices at SameDaySupplements.com® It's always easy to shop for PSYCHOTIC Pre Workout by Insane Labz at SameDaySupplements.com® because you can browse by reviews, brand, prices or search for specific ingredients using our search tool. In-stock orders placed before 3pm EST ship out the same day to USA, Brazil, United Kingdom, Canada, Germany, Australia, Japan, India, France and worldwide at the cheapest prices online.